Embroidery is the art of decorating a piece of substrate fabric (such as the twill that we use to make our embroidered patches) by stitching or sewing lettering or a decorative pattern onto the surface of the twill with various color threads. 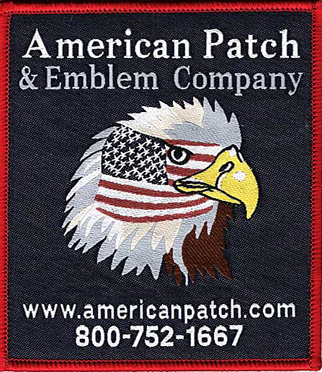 Embroidered patches are the most traditional type and are easily identified when one runs a finger over the design, as you will easily feel the embroidery rising on top of the flat underlying twill. This texture of the embroidered patch gives rise to a somewhat three dimensional appearance. When a patch is woven, we actually use different color threads to manufacture the fabric. The decorative pattern or lettering is actually a part of the fabric as opposed to being merely a decorative aspect that is placed onto a fabric. When you run a finger across a woven patch it is flat as the lettering or pattern is actually a part of the fabric. Both of these patches can usually (assuming no interior right or acute angles) be further enhanced by use of a merrowed border, which appears to be a binding surrounding the outer edge of the patch. 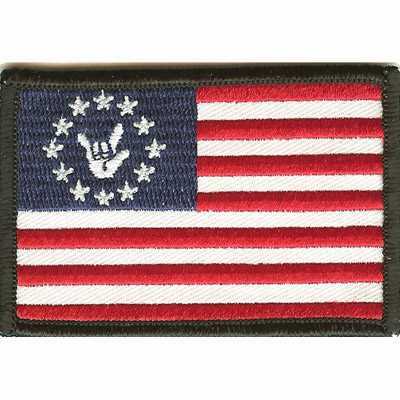 Traditionalists certainly prefer the look and feel of the embroidered patch, however, we are able to achieve much finer detail and very clean and sharp lettering with the woven versions. Please don’t hesitate to contact our office and we will be happy to answer any further questions you may have and advise on your particular design. This entry was posted in General Information and tagged embroidered, sewing, thread, woven.